Colleague’s son missing. Need your kindness to spread this message via your blogs/FB pages. 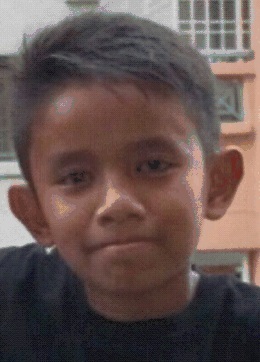 If anyone has any information regarding the whereabouts of this child, please do not hesitate to contact his mother, Zalina Ab Aziz, at 019 227 1138 or contact the police immediately. missjewelz would truly appreciate if we all can help Puan Zalina increase her hope to find her missing son. Next Update : Colleague’s son missing. Salam. Just wondering. How did Aiman end up in a Asrama Anak Yatim when he has a mother? The status of anak yatim is based on the death of the father. That was also my biggest question the minute i saw the contact person no. that boy must have been very sad staying in asrama anak yatim without the love of his family…..
Anak YATIM tu…bukan anak YATIM PIATU kot? �salam. the boy lost his father 2-3 years ago. he passed away due to dengue. the boy has another �brother, and a younger sister. thank you for the concern. my question is why the yayasan didnt lodge a police report when he went missing for a month and why did the mother only plea for help of looking for him only after a month. logically, he is living in the orphanage home but no one from the orphanage did something after 48 hrs of him missing? doesnt make sense at all. I appreciate the comments and feedback. If you have any related sites that you can recommend other readers to read (related to this issue), feel free to put them in the comment box . We often take for granted the things we don’t know until it hits us right in the face. so is it true the boy is now found? ?